Adam and the Sacred Nine: A Cabbalistic Drama. Adam and the Sacred Nine was first published by Ted and Olwyn Hughes’s Rainbow Press in the Spring of 1979. This limited edition of 160 copies contained the full sequence of poems, five of which were dropped when the sequence was incorporated in Moortown (Faber 1979). The full Rainbow Press edition represents, I believe, Ted’s first use of Cabbala as a framework for a sequence of poems, and the Cabbala he used was a version of that which was developed by the Hermetic Occult NeoPlatonists of the Italian Renaissance. Renaissance Cabbala was largely based on the work of Pico della Mirandola (1463-1494), who translated Hebrew Cabbala into Latin and adapted it to a contemporary Christian framework. Pico’s Cabbala, however, was married to the Gnosticism, Alchemy, astrology and magic which he had learned from his mentor, Marsilio Ficino (1433-1499), whose own pioneering translations brought together philosophical texts by Plato, Pythagoras and the (reputedly) Egyptian, Hermes Trismagistus. This so-called ‘Christian Cabbala’, with and without Alchemy and the other occult and mystical beliefs, strongly influenced the work of sixteenth century artists, writers and poets in Italy and England, and Ted discussed its influence on English Elizabethan poets in his ‘Introduction’ to Shakespeare and the Goddess of Complete Being (Faber, 1992. pp.18-34). He had read the work of Pico and Ficino, and also that of the scholar, Frances Yates, whose Giordano Bruno and the Hermetic Tradition (University of Chicago Press, London, 1979) documents the development of Renaissance Hermetic NeoPlatonism and the changes it brought to religion and the arts. Ted noted the influence of Christian Cabbala on Sir Philip Sidney and his literary circle, on John Dee, Sir Francis Bacon, Chapman, Milton and others. Its structural patterns and numerology have been traced by scholars in the work of Dante, Spencer, Donne, Shakespeare and Milton1, and they are especially apparent in the work of Blake and Yeats, both of whom strongly influenced Ted’s own work. In Adam and the Sacred Nine, the cosmos which Ted’s Adam inhabits is a Hermetic NeoPlatonic cosmos: one in which the whole of creation resonates to the harmony of the Spheres of which it is composed. It is a cosmos in which the mercurial Female Principle (which for Cabbalists is Nature, the Female aspect of God, Sophia and, for Jewish Cabbalists, the Shekinah) is divided from the Male aspect of God and is exiled in Matter. In this cosmos, humankind, made in the image of God, embodies a spark of Divine creative energy and is, therefore, given the task of fostering that energy in order to reunite the Female and Male aspects of the Godhead and, thus, re-create the natural balance which obtained at the first moment of Creation. Significantly, for a poet, the Divine Spark within us which must do this work is what Renaissance Cabbalist, Robert Fludd (1574-1637) called the ‘Creative Imagination’, and it is this which urges us towards knowledge and enlightenment. Significantly, too, this task requires the active pursuit of self-knowledge and the development of will and determination. It is a task which Ted’s protagonists, until Adam, had constantly attempted and, as constantly, failed to achieve. Writing to Keith Sagar in April 1980, shortly after Adam and the Sacred Nine had been published in the Faber trade edition of Moortown, Ted linked Adam to the protagonist of the ‘Prometheus’, ‘Earth-Numb’ and ‘Moortown’ sequences in that book. The “first part [Moortown]&rduo;, he wrote, “is a life embedded in mud, body of death etc. & seeds. Prometheus is what tries to wake up inside this. Earth Numb is his failing effort to come to terms with it. Adam is his succeeding means of coming to terms with it”. He went on to say that “the whole drift is an alchemising of a phoenix out of a serpent. An awakening life out of an unawakened”2. Both phoenix and serpent are alchemical symbols, and Alchemy, like Cabbala, is a spiritual art. Summing up the whole group of poems in alchemical imagery, Ted described them as repeated efforts to bring about a “birth” in the “supernatural, spirit, inner world” of his protagonists. The mystical, healing intent of this is clear. 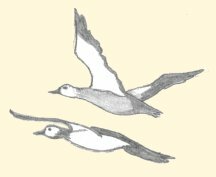 What distinguishes Adam and the Sacred Nine as a specifically Cabbalistic sequence, however, is the very presence of Adam and of the nine “sacred” birds. From 1979, when Ted first began to write bird poems influenced by the mystical Sufi fable The Conference of the Birds3, Alchemy had been an underlying theme and purpose in his work4. But Adam, with his Biblical origins deep in Jewish and Christian lore, introduced a more specifically Cabbalistic dimension into Ted’s work. Adam, whose name comes from the Hebrew (meaning ‘man’), is regarded by Cabbalists as representing “the great name of God in His creative unfolding”5. He is god’s representative on earth and always, in Cabbala, he has a special status, and a special task to perform in this world. What distinguishes him from other animals is his ability to ask questions. He is known as the “question-asking creature”6. As descendents of Adam, it is appropriate that we, too, should ask questions, and a number of questions arise in regard to Adam and the Sacred Nine. Who is Adam? Why are the birds sacred? What do the birds teach Adam? Why are there nine birds? And why must Adam be woken? All but the last two of these questions have been partly answered by others (Scigaj, Sagar and Robinson, in particular)7 without recourse to Cabbala. Cabbala, however, offers very specific and very precise answers to all the questions in a way which is wholly appropriate to the shamanic, healing purpose which is common to Ted’s poetry. Adam, of course, is more than just the Biblical progenitor of the human race. He is a symbol of all humankind, including you and me. He is also, as others have noted, Ted himself searching for self-knowledge, understanding and healing. Ted’s purpose, too, was not just personal, but universal: the poems not only bring Adam to spiritual rebirth, they also subject the poet and the reader to a process which is intended to heal the division between us and nature. Adam, therefore, undertakes the shamanistic task of reintegration and regeneration in our world. Such, is the generally accepted view of Adam, but his task is also, as I intend to show, the Alchemical/Hermetic and, specifically, Cabbalistic task of reuniting the Female and Male aspects of God. There is agreement, too, about the sacredness and the general purpose of the birds, and this is based on Ted’s own statement, in various introductions to these poems, that the “nine divine birds” are sent down to Adam by “his creator”, “to become his guardian exemplary spirits” and to “bring their gift of ‘how to live’”8. All this is true. Cabbala, however, explains more than this. The Cabbalistic Tree, in Ted’s own words, is “a contrivance for imagining the ordered universe”9. Like myth, religion and science, it provides a framework within which to contemplate the mysteries of the world and our place in it. 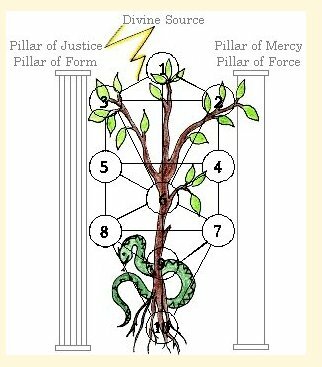 Specifically, Ted writes, Cabbala offers “a memory system”, a “mnemonic visual image” which consists of a tree on which the branches form “a pattern of ten ascending stations (Sephiroth – Angelic Powers) positioned on and between the pillars of Justice and Mercy, mounting from the lowest Hells to the Divine Source. The ten stations encompass all the possibilities of existence”. The first step in any mystical journey is to find and to foster the Divine spark within ourselves. And the Cabbalist begins this process by climbing, through meditation (or, in Ted’s case, through poetic ritual), the Path of the Serpent, which begins at the lowest Sephira (Malkuth) on the Cabbalistic Tree and climbs, “step by step” through the ten Sephirothic stations “towards union with the Divine Source” at the Tree’s apex. Each of the ten Sephirothic stations has several mnemonic aids associated with it to help the Cabbalist to remember and understand its energies. Each has a title, and a number which has spiritual meaning and significance. Each has a Virtue which represents its energies in perfect balance; a Vice which is caused by an excess or an insufficiency of those energies; and a Qlippoth, which represents the darkest, most degraded and impure state of those energies. For each, there is an associated Hebrew God name; and for each there is an Angel or Archangel with particular duties. Each is associated, too, with a specific Mystical Experience which the Cabbalist may expect at that particular stage in his or her journey. Each, too, exists within a particular Planetary Sphere and has its own Magic Image for contemplation. Sometimes one or more of these meditation aids are clearly present in Ted’s poems: more often, they provide the visual and imaginative stimuli from which he draws when dealing with each Sephirothic station in the poems of Adam and the Scared Nine. As is appropriate, Ted’s poetic, Cabbalistic journey in Adam and the Sacred Nine begins at Malkuth, Sephiroth number 10 at the base of the Cabbalistic Tree. This is our Earth, our physical world, and it is furthest from the pure, creative, spiritual energies of the Divine Source. Into this world Ted introduces ‘The Song’ (THCP 443), a poem which, in his introduction, he quite specifically calls “an invocation”. The song of Ted’s poem is pure energy. It is a part of the harmonic music which Plato, following Pythagoras, described as being caused by the vibration and motion of the Celestial Spheres. It is the “Nature-Music” which, as the Renaissance musicologist Athanasius Kircher wrote in 1662, “contains within itself the nature of all things” and is “the great cosmo-music / the wonderful harmony of heaven / of the elements and of all creatures”10. Like the mythical magical and fertile wind associated with Orpheus and Pan, this song exists simply as vibrations. It stirs the air, the water, the leaves, the stones: it echoes from the “hill-slope”, but it is “careless” of the physical elements of the world it is in and of the mouth, throat, “lungs and veins” from which it pours. It is “The song made of joy”; and in many respects it is like the “lark-song hidden in the wind” which is heard in the “cradle-grave” of Elmet, “where the mothers gallop their souls”11: it exists in Adam’s world, the physical world created from the four alchemical ‘Mothers’ – Fire, Air, Earth, Water. This is the Sphere of Malkuth, which is known as ‘The Gate of Life’ and ‘The Gate of Death’, and the song pours out over the “empty grave” of what has not yet been born. The song is a song of “happiness, secret and wild”, but “like a lament” it searches for something which does not yet exist: something which, in Cabbalistic terms, must be found in Adam, for this is the lament of Nature separated from the Divine Source, and she searches for the Divine Spark in Adam through which they may work together towards reunion and wholeness. Adam, however, lies at Malkuth, prone on the earth from which he was made and to which he must return. Above him, the Sephirothic Tree stretches upwards to infinity and the immaterial light of the Divine Source, but here on Earth that light is fragmented, dispersed and mixed with darkness. Adam exists in a world of division, disorder, and spiritual darkness, and he lies “defeated”. He has, as Ted says in his introductions, “fallen as usual”, which is a curious phrase, since the Biblical Adam fell only once. At Malkuth, however, all the disparate energies of the Tree are gathered and this includes all history, all mythology and all religions – everything known and everything that we know, think and dream – everything which makes up the world as we know it. Time and again, Mankind has raised itself out of the mud and sought enlightenment. Time and again, we have fallen back into indifference, disaster and war. Individually, too, we struggle to understand the world and our place in it; struggle to balance the rational and the non-rational sides of our nature; struggle with the extremes of love and hate, needs and desires, worldly and spiritual problems. We look for the spark of light which, in NeoPlatonic terms is often depicted as striving “for divine knowledge out of the darkness of the world” and is reflected in the individual soul’s “struggle for salvation”12. Again and again we give up the struggle and, like Adam, lie defeated, exhausted, “low as water”. So, Ted’s Adam has “fallen as usual”. 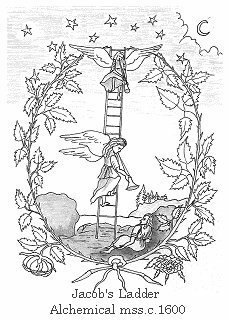 He dreams “the tower of light”, which might well be the Sephirothic Tree which towers above him like Jacob’s ladder or the Platonic pillar of light which extends from heaven to earth13; but it could equally be a symbol of security and strength, guidance and hope. Adam, like many powerless humans, dreams of “echelons” (military divisions) of steel and of warfare. He is “rigged” (which has the nautical meaning of ‘equipped with sails’ but can also mean simply ‘clothed’) like a ship of hope but only with frail “twigs”, so, he dreams of the powerful progress of “bulldozers and cranes”, machines with which he may build walls to protect himself. In his fragile, easily bruised state, he dreams of indestructible immortality, a “diamond body” like that of Taoist religion, perfect and incorruptible. Adam’s dreams defy his natural, naked state but they also re-iterate human history where, too often, our dreams and our creative energies have gone beyond the natural need for security, self-defence and physical and spiritual nourishment and have tipped over into rigid, over-ambitious and destructive desires. Most importantly, from the Cabbalistic point of view, our spiritual dreams of wholeness, harmony and of achieving the ‘diamond’ state of illumination and incorruptibility too often become mired in dogma, rules, religious bigotry and ambition, and we, like Adam, fall “as usual”. The Illusion of Malkuth is Materialism. It is the illusion of ownership of worldly things. Adam’s dreams are of the possible and the impossible but they are all worldly, even “the religion of the diamond body”; and all are earth-bound. The divine spark within him, that “spirit awareness” which Ted likened in his letter to Sagar to the intuition of “something very brilliant and strange”, which he sees only as if he were trying “to see through blindfoldedness or nearly sealed eyes”, is “humbled to the physical body-cell confinement”14. So, he lies helpless, defeated, vulnerable and tormented by what he cannot achieve and what he cannot have. His “morse” (his signals to others) has ceased, he is mentally, physically and emotionally as low as it is possible for a human being to be. He exhibits the same “anaesthetised alienation” as that of Ted’s protagonist at the beginning of Cave Birds and exists as the “most debased raw material of de-spiritualised entropy”15. In some respects this is good. Adam, now, is one with the mud from which he was created. He has become the prima materia from which any Alchemical and Cabbalistic purification must begin, and the sharpness of the animals and plants which come to him in the next poem, ‘Awake’ (THCP 444), acts like Alchemical Sulphur, biting and breaking down impurities. He has reached the same state as that exhibited by the Knight, in Cave Birds, but unlike the Knight he is not victorious in his defeat: there is no suggestion that Adam has conquered his physical body or that he will offer his bones to Nature as a sacrifice. He simply lies there, immobile, without the will to stir, sinking deeper into the state of ‘Stasis’ which is the Qlippoth of Malkuth - the most negative, degraded state, which is as close to the darkness and oblivion of death as it is possible to be. And it is not Alchemy which will effect his rescue in this sequence, but Cabbala. In the full, Rainbow Press, sequence of Adam and the Sacred Nine, ‘Awake!’describes the attempts of Nature (animals and plants) to make Adam move. “Get up”, they cry, seven times. Seven was an important number for Renaissance Cabbalists. It is the formative and creative number of Nature, which is the ‘Soul of the World’; the number which raises humankind from the mundane to the spiritual level. â€œGet up!”, “Awake!”, “Arise!”, cry the “flint-faced bird”, the “harpoon-shaped fish”, the weasel, the thorn leaf, the thistle and the ant. All are sharp, biting, piercing, prickly things. They demand, plead, cajole and shame Adam. They remind him of his responsibility for them, a responsibility which, as the Bible tells and Cabbalists believe, was given him by God at the Creation (Genesis: 1:28-30) and which he undertook in the act of naming the animals (Genesis 2:19-20). “We depend on you”, they tell him, “don’t discourage the hosts, they are all watching”. Ted was never casual in his choice of words in his poems, so the word ‘hosts’ was carefully chosen. Who or what are these watchful hosts? They may well be the hosts of plants and animals who wait for Adam to be woken; but there is also a suggestion in that word that Adam is a guest or a lodger in this world and, so, is under some obligation to whoever is providing for his needs. ‘Hosts’ also has a religious meaning. It refers to the consecrated elements which lie at the heart of religious rituals and which bind human and God together. These sacramental ‘hosts’ await Adam if and when he is ready to stir himself and approach God; and the Divine Spark within him needs this spiritual nourishment in order to survive. 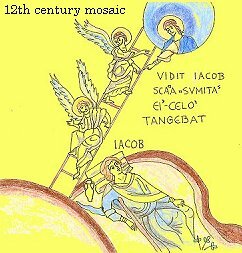 For Cabbalists, too, this Divine Spark is essential for the healing task which Adam must undertake and, for them, ‘hosts’ refers to the Hosts of Heaven and, specifically, to the Hebrew ‘Irin’ (meaning ‘those who watch and wait’) – including Archangels like Michael and Gabriel who have the special role of watching over Creation and acting as intermediaries between human beings and God16. Whatever the hosts are, Adam ignores them: just as he ignores the urgings of the plants and animals. The next two poems in the Rainbow Press edition, tell of Adam’s abject misery but also of the persistence of the Divine Spirit within him. In the first poem, this spirit is no more than “his cry”. Like the song which is Ted’s invocation, it is a vibration in the air, “a breeze”, a magical “starry wind” which stirs the “dry grass” lamenting his “lost gamble”. Paradoxically, it is “his cry” and yet it has “nothing at all to do with him”. It is “just passing”; just “random atoms”, helpless to control him as he is helpless to control it. Ted’s imagery of wind and stars and sun, identifies the cry with the world of Nature. Adam is the human agent whose task it is to aid Nature’s struggle for reunion with the Divine Source, but he refuses to co-operate: so, this cry is a lament. The loss, however, is both Adam’s and Nature’s. Without his own efforts, Adam will never achieve spiritual enlightenment: he will never reach the sun, which is not only the source of life but is also the traditional symbol in all mystical teachings for the Divine Source. The cry, therefore, is Adam’s and Nature’s “sun-grief” for the spiritual and ecological death and sterility which his inaction and his lack of care will inevitably bring: our globe, our Earth, the Sephirothic Sphere of Malkuth, will become a barren “stone” – a memorial to Adam’s failure. But Adam is not yet dead. He has “retreated” to “the last redoubt of bone”, like a shaman who must die to our world, contemplate his own skeleton and be reborn from bone-seed before he can fly through the gateway to the Other World on his mythic healing journey. All ambition, all physical and worldly trappings have gone: only bone, “his skeleton”, “the final trophy”, “one of the elementals – eternal” is left in “its hanger of emptiness”. Nevertheless, within Adam, lodged in his bones, immortal, “beyond birth-pang and maggot”, there remains a vibration - “a voice”. The “Southern Cross”, the “bright sky-crack of listening”, the “bone-star” of Ted’s imagery, all identify this voice as a guiding light in the darkness and emptiness which now surrounds him. Here at Malkuth, in Cabbalistic terms, that voice can only be the spark of Divine energy within Adam which links him with Nature: and, appropriately consistent with Ted’s star imagery, Nature herself is personified in Cabbala as the star-goddess, Venus. Now, “at last”, as Ted tells us in his BBC introduction to the poems, Adam’s “creator can’t stand it any longer. And so he sends down nine divine birds to become his guardian exemplary spirits”. They come, as the Introduction in the Rainbow Press edition says, “to tell him how to live”. Who is this “creator”? He is clearly not the perfect Divine Source of the Christian Hermetic NeoPlatonists, nor is he the unmanifest, transcendent AYIN of Jewish Cabbala. He is too human in his impatience, too ready to intervene with things in our world by sending the nine birds to awaken Adam to be either of these. Ted‘s Creator is clearly a human invention, very like his God in the Crow poems and his Tales of the Early World. Yet, Cabbala, too is a human invention. In its highest form, Cabbala is an idea - an infinitely flexible pattern which allows for a lifetime of meditation on the “something very brilliant and strange” of which Ted spoke in his letter to Sagar17, something which seems to lie beyond our understanding. In our struggle to understand, however, we invent stories, myths and fables: we regard intuitions with suspicion and we take ideas and try to pin them down in rational and logical forms. So, our notions of that “something very brilliant and strange” becomes progressively more fixed and rigid. The earliest Cabbalists recognized this danger and, paradoxically, built it into their pattern of the Cabbalistic Tree. They imagined the Tree as linking four intersecting Worlds, each of which contains ten Sephirothic ‘stations’. The topmost World, nearest the Divine Source, is the World of Atziluth – the World of Emanation, within which the Sephiroth are pure, formless, expressions of God’s energies, inaccessible to normal consciousness. Below, but connected to the Atziluthic World, is the World of Briah – the World of Creation, where abstract patterns flow and everything is present in potential. Here, the energies begin to separate and diffuse, but nothing is yet determined or fixed. 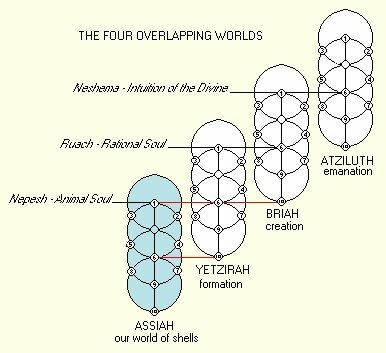 Below this again, is the World of Yetzirah – the World of Formation. Energies here begin to be shaped into complex but abstract patterns. These are the patterns of thought which in the fourth, lowest World of Assiah – the World of Making, become material and fixed. We, Adam, all creatures, all plants, all things manifest, real and tangible, exist at Malkuth, the lowest Sephira in the lowest World of Assiah, and Ted’s Creator, too, exists here. He is, however, like everything else in this lowest World, a reflection of the purer light and energy of the Worlds above us. 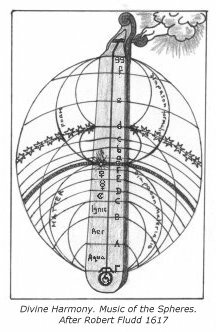 But he is also directly linked on the central Pillar of the extended Cabbalistic Tree to all of those upper Worlds and to the Divine Source. 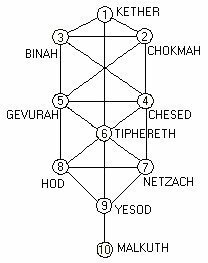 Ted, in Adam and the Sacred Nine, did not use the extended Tree, only the ten Sephiroth of the World of Assiah18. He also worked consciously in Malkuth, knowing full well that all the energies of all the Worlds and all the necessary elements of creation, are gathered here; and that it requires only a Cabbalist’s creative imagination, knowledge, trained will and determination to effect change in the existing patterns. Here, in our World at Malkuth, is where every spiritual journey must begin. Adam’s Creator, like all the Creators we have invented in myth, religion and story, reflects our limited human understanding of Creation. He is a mere shadow of something we are unable to describe or understand, but, still, he embodies supernatural powers. These he uses to send down to Adam nine “divine” messengers who enter this Worlds of Assiah as “just ordinary birds”. The divine messengers of Cabbala are the Angels (the word means ‘messenger’), and Ted described the Sephiroth as “Angelic Powers”. These immaterial, supernatural emanations are the link between God and humankind and each of the ten Sephiroth is governed by a particular Angelic host. Above Adam, who lies prone on the Earth at Malkuth, rise nine Sephiroth whose stations (to use Ted’s term) he must visit in order to reach the Divine Source. At each Sephirothic station he has something new to learn about how to live as a fully conscious, spiritually aware and active agent of the Divine Spark within him. But in order to begin this work he must first be woken from the physical and spiritual stasis in which he lies. So, the Sephirothic Angels – the “guardian exemplary spirits” as Ted called them – take on the form of ordinary domestic birds; birds with which Adam (and we) are familiar in our ordinary, domestic environment; birds which share our everyday lives with us and which, in Malkuth, come to us with all the accumulated stories, myths, folk-lore and legends of human invention, as well as whatever knowledge we have acquired of them directly or indirectly. “The first bird to arrive over the prone and apparently unconscious Adam”, Ted tells us, “is the falcon”. 1. Literary scholar, Alastair Fowler, in particular, has published widely on the use of Cabbala in the structural patterns of Elizabethan poetry. 2. Ted Hughes to Keith Sagar, 23 April 1980. Reid (Ed.) Letters of Ted Hughes, Faber, 2000. pp. 431-2. 3. The Conference of the Birds is a fable of the journey to self-knowledge. It was composed in the twelfth century by Farud Ud-Din Attar and is a classic of Sufi literature. 5. The distinguished Jewish Scholar, Gershom Scholem, explains that ‘Yod he vav he’ (the four letters of the name of God) have, in Hebrew gematria, the numerical value 45, as does the word ‘Adam’. Scholem, On Kabbalah and its Symbolism, Schocken Books, N.Y. 1965. p.104. 6. Lancaster, B. The Essence of Kabbalah, Eagle Editions, Royston, Herts. U.K., 2005. p.131. 7. Scigaj, L. The Poetry of Ted Hughes, University of Iowa Press, 1986, pp.279-286. Sagar, K. The Laughter of Foxes, Liverpool University Press, 2000. pp.136-7. Robinson, C. Ted Hughes as Shepherd of Being, MacMillan, 1989, pp.181-195. Scigaj does recognize the Cabbalistic symbolism of Baskin’s snake on the cover of Faber’s edition of Moortown and he links this with Adam but he does not follow this up in detail in his discussion of the poems, choosing, rather, to emphasize Blakean parallels. 8. Note in The Rainbow Press edition of Adam and the Sacred Nine, and Ted’s introduction to the BBC Radio 3 reading of some of the poems, given on 17 May 1980. 9. Hughes, T. Shakespeare and the Goddess of Complete Being, Faber, 1992. pp.20-21. 10. Kircher, Musurgia Universalis, 1662, quoted by Roob, A. Alchemy and Mysticism, Taschen, Koln, 1997. p.89. 13. Plato describes this in detail in his fable of El in The Republic, Book X. Stephanus (1578), pp.616-7. 14. Op.cit. Hughes to Sagar, 23 April 1980. 15. Ted’s description of his unenlightened protagonist in a letter to me: 3 Nov. 1984. Published in Reid, C. Letters of Ted Hughes, Faber, 2007. pp 491-3. 16. Cabbalist and teacher, Warren Kenton (Z’ev ben Shimon Halevi), describes the Irin as a “Holy inner council”, “the Messengers” and “the watchers who never sleep”, and he allocates them to specific positions on the Cabbalistic Tree. A Kabbalistic Universe, Weiser Books, Boston, 1977, pp.59-60. 17. Op.Cit. Hughes to Sagar, 23 April 1980. 18. Later, when Ted was at the height of his creative powers, had a great depth of mystical and spiritual knowledge and had spent a lifetime training and developing his magical Will, he made full use of the four Worlds of the extended Tree, and all the subtle varied powers they present, to undertake the Cabbalistic journeys which are the foundation of Capriccio, Howls & Whispers and Birthday Letters.